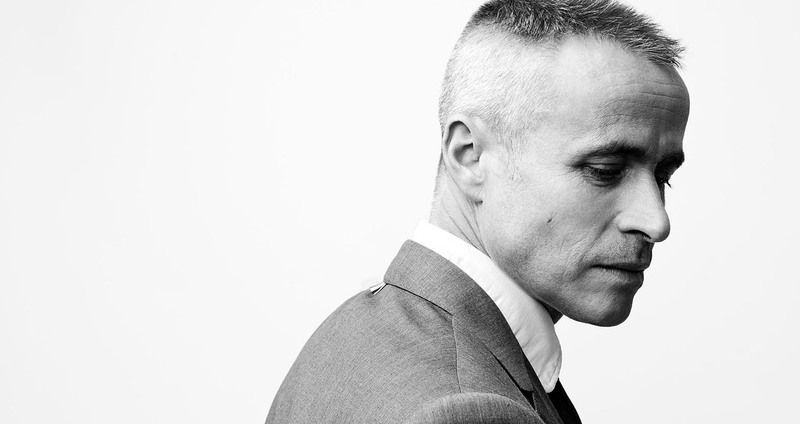 Over the past decade, Thom Browne has become one of the most remarkable designers in New York. To say that he has shifted the eye on menswear proportions is stating the obvious. If his shrunken suit jackets and trousers hemmed above the ankle were once seen as provocative, they are now part of the fashion dictionary. He has brought the same tailoring and imagination to womenswear, reinventing the concept of uniforms and uniformity. Browne’s shows are just as thought-inspiring and provide memorable displays of fashion theater, where every detail lends itself to analysis – from Bjork on the soundtrack to the clattering of typewriters at his Florence show, the mourning dresses, and exaggerated Elizabethan silhouettes with zombie-like undertones. Browne sat down with The Impression/CFDA to elaborate on his fashion philosophy, fashion drama and his downtime obsession with the Kardashians. Marc Karimzadeh: Thom, thank you so much for taking the time to sit down with us. Let’s go back to your beginnings. Tell me about your youth, school, and how it led you to realize you were going to be a fashion designer. Thom Browne: I always feel that everything builds upon each other. Sometimes I look back at school and think there is nothing that has anything to do with what I am doing now. Directly, it doesn’t. But indirectly, there are definitely things that do, whether it’s swimming, or school at Notre Dame, which was very classically conservative. Maybe that makes me want to do the polar opposite now and be a little bit more on my own. Not a rebel, but really wanting to be true to myself and making people think. After graduating school, I didn’t have any idea of what I wanted to do. It was those couple of years out of school through L.A. that led me into the fashion world. I had no formal training. But I knew that the last thing the world needs was just another designer making clothes. I wanted to do something that, when people look back, meant something… I wanted there to be a reason why I am doing what I am doing. That’s how it started, with the first five suits I made for myself. It took a good two years for people to really understand what this exactly was, but I was very confident. Working with Rocco, the tailor, in the beginning – the quality he was giving me in the sensibility and proportions that I wanted – I knew there was something there. There was a reason for me to exist in the fashion world. I wanted to to reintroduce tailored clothing for men and women that didn’t feel so much like tailored clothes. So many guys were running away from tailored clothing. It just had such a boring, conservative reputation. It was considered for work, and you put it in the closet on the weekend. I wanted to reintroduce it for a young guy who felt like it was cool again. I think that’s even more interesting for women, because there is such confidence and individuality in tailoring for women. There has to be a point of view. As a women’s designer, the last thing you need is just another designer designing dresses. There has to be something new and interesting about reintroducing tailored clothing for girls. Marc Karimzadeh: Before you started your own eponymous label, you worked for Club Monaco, which is part of the Ralph Lauren Corp. How did that shape your approach to fashion? How did this lead you to start on your own? 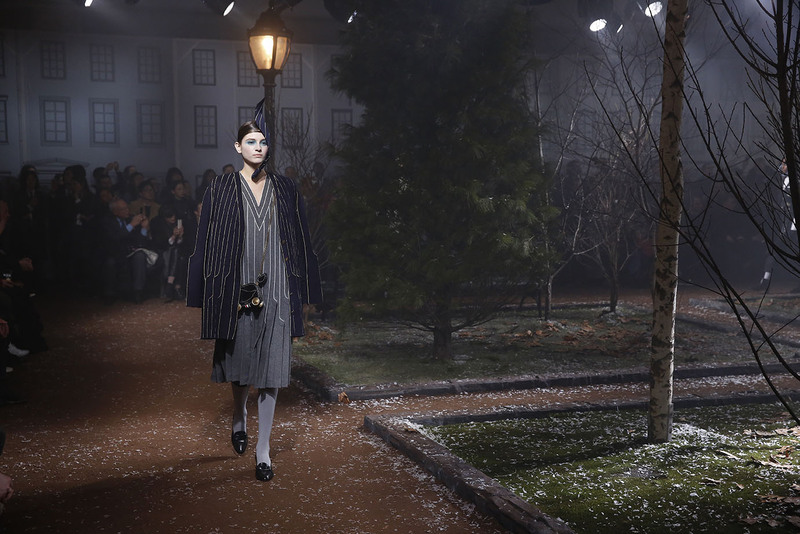 Thom Browne: I also attribute this to Giorgio Armani, where I worked before Club Monaco. You learn how these amazing, iconic designers created the world that everybody knows of now. I didn’t specifically learn so much about design, I learned about the world of fashion and the business of fashion when I worked there. What I do is so different from their sensibilities, but when I was there, I appreciated their sensibilities because that is who they were. When you look at really successful companies, there is an image in your head of what they represent. Ralph and Giorgio Armani are some of the best at that. Marc Karimzadeh:That idea of the ‘World of’ is always fascinating to me – that idea that when you walk into their retail or office environment, you are immediately immersed into the lifestyle. You enter their zone. Thom Browne: It is important because there is so much out there. You have to be conscious of creating something that, when you think of that person’s name, you have an image in your head. I was really conscious of that in the beginning. I knew that this was really important. Once you establish that, you can really do anything you want. That’s why my shows can be as provocative as they are, but you still have that pure, basic image of what the collection stands for. It always starts with that simple, classic, tailored point of view and the shows go off in whatever direction they want. When you come into the showroom, you see where the classic part comes in. The best designers and brands in the world have a clear image of what they represent. Marc Karimzadeh: The importance of proportion. You have practically caused a revolution, and moved the ‘in’ menswear with your suits. I myself recently became a convert when I bought my first Thom Browne suit. How did that come about? What made you decide to challenge menswear this way? 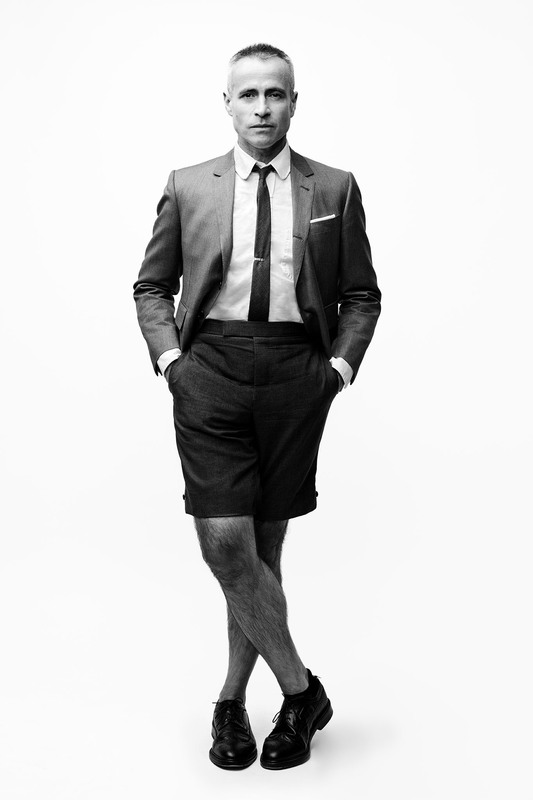 Thom Browne: Proportion is always a big design element I play with. It started from that first jacket and trouser. I wanted that proportion for myself. I also knew that in order to make that classic piece of clothing for men interesting, the best thing to do was to play with the proportion. People didn’t understand it initially. They thought it didn’t fit. But it does. It tricks your eye, and actually, once you get used to it, it’s hard to go back to wearing something else. I play with proportion every season, whether it’s in grand-scale or shrinking things down. It’s an interesting way of looking at yourself. Marc Karimzadeh: Do you remember those early reactions to your suits? 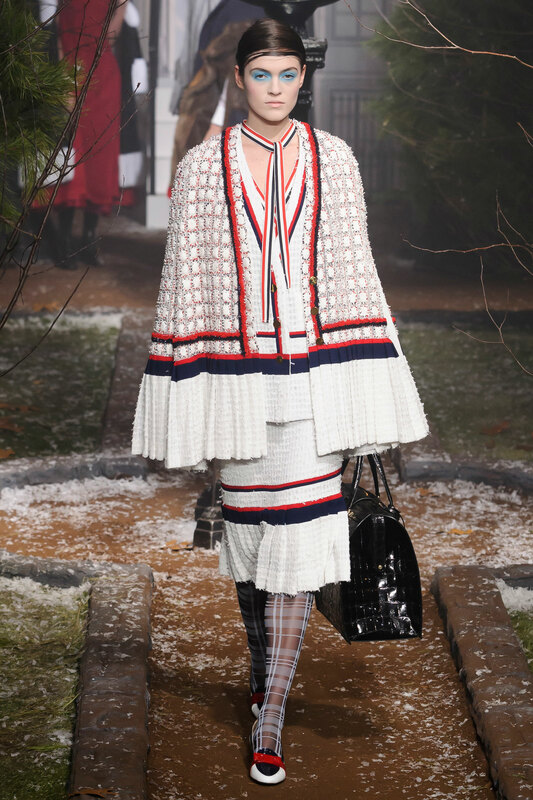 Thom Browne: Oh my god, yes. Even 15 years in, we still get the reactions. Being here in New York, or in Paris or Milan or Tokyo, you get used to people understanding this. Once you leave, once you get into middle America, it’s still something very new. I remember it all. I appreciated that it made people think. Sometimes, the word ‘provocative’ means intimidating, but I think ‘provocative’ just makes people think. It was important for me to get those reactions. I think that anybody who wants to do something different and is not ready for negative reactions shouldn’t be trying to do something new. It’s important to get people to not like something that you do. Because then, you also get the opposite. You get the people who really like what you do. Marc Karimzadeh: This leads me to your fashion shows. How do you feel about the theater of fashion? Is this something you consciously pursue as part of your message? Thom Browne: For me, my shows are really important. I love doing them. I love the entertainment of them. I love giving a story to the collections. I don’t understand why more designers don’t. If I wasn’t able to do my shows, I wouldn’t be as interested in fashion as I am. If I wasn’t able to do my shows, I wouldn’t be as interested in fashion as I am. Marc Karimzadeh: Have you had a favorite show over the years? 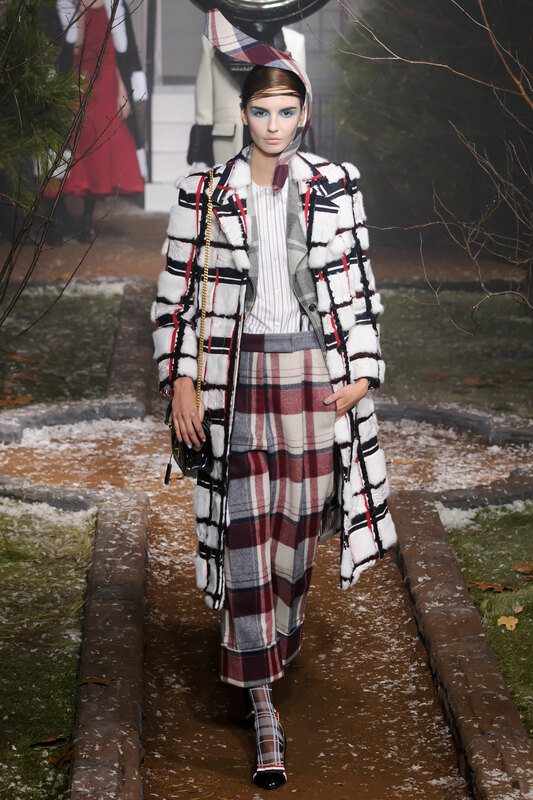 Thom Browne: There were some that stick out more than others, but each is important in its own way. There have been pivotal ones, like the show for men’s at Pitti Uomo in Florence. I love my early shows at the library. Those shows were important. They were the beginning of my introducing women’s to my man’s world, but I can’t say that there was one favorite. Marc Karimzadeh: When you think about the landscape of New York fashion, I would say you that you are perhaps one of a handful of designers who put that kind of intellectual effort into their show. What is your view of how New York Fashion Week compares to the rest of the world? Thom Browne: I appreciate every designer doing their own thing. However, they want to approach their shows, their collections, just staying in business in fashion should be applauded. That being said, I do approach it differently than most. The shows are really important to me. I don’t approach it from a commercial point of view, especially with the collections in the shows. I have a very strong part of the collection that’s in the showroom, but I don’t always feel like that needs to be shown. My shows are to be provocative, to entertain, to make people laugh, to be pure entertainment. But they are rooted in how well the clothes are being made, and how serious I spent the last six months on an idea or a concept. New York can sometimes approach things more commercially than Europe, but I think New York has always been about fashion and commerce. That is what we appreciate about New York. But everyone should do it their own way. Marc Karimzadeh: You talk about entertainment and the show as a true expression of what you do and your craft. What is your opinion on the consumer-minded fashion show?Thom Browne: If that’s how you want to approach it, then that’s exactly what you should do. I do also think about my consumer, but I feel that I want to elevate my consumer in a way that it makes them want to think about the classic things that I do. The shows make that classic part of my collection so much more interesting. I like to make that consumer think, and think about clothing and design differently. They should look at it from a purely design point of view, and know that I am responsible enough to have a huge commercial idea that is derived from that show. Marc Karimzadeh: Do you consider wool a year-round material? Thom Browne: I use it year-round. The world is almost becoming one season, in a way. I develop all of the fabrics for each collection, and I use wools in the spring and I use wools in the fall. I use cotton in the spring and I use cotton in the fall. I use fur in the spring and I use fur in the fall. Especially when the clothing actually gets to stores, it’s not always so in the season. I think of the year, not the season. Marc Karimzadeh: Accessories, of course, can be the ultimate seasonless item. How have sales of the Hector bag been? 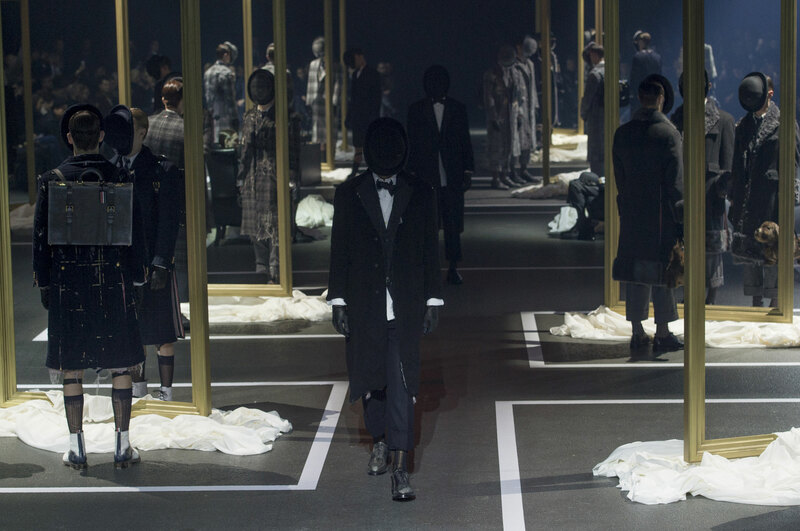 Thom Browne: It was supposed to be a joke at the beginning. It’s really charming, and I think it does well because people see the connection between it and me. We sold so many of them. People appreciate the humor and whimsy in it, but it’s also utilitarian and well-made, so it’s actually not a joke. It’s just a good-looking bag that’s funny, which people appreciate. Marc Karimzadeh:What I love about the bag is how it adds a sense of lightness, and makes the sense of humor in your aesthetic very clear, which I don’t think everyone necessarily sees. 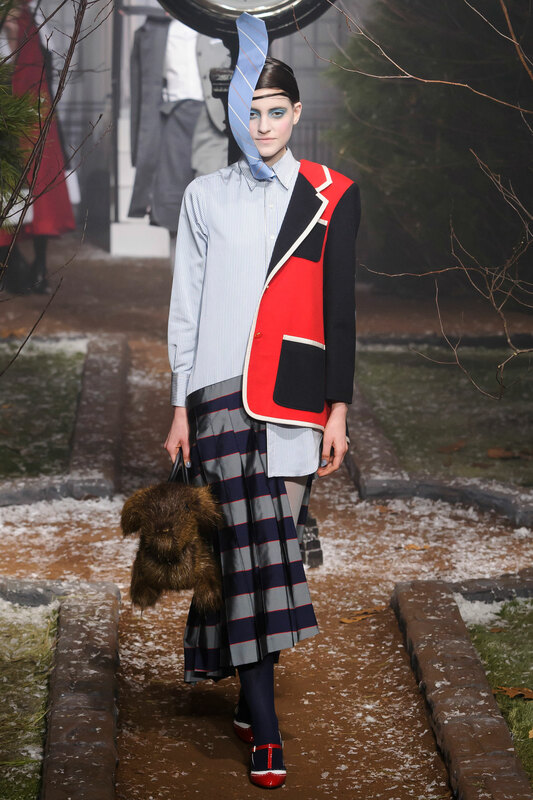 Thom Browne: That speaks to the shows. You look at the people, and some of them look so serious watching it, and I think, ‘God, you guys, lighten up.’ I do some things so you actually can smile. I do some things just for the sheer entertainment of them. Some of it is to counterbalance the seriousness of the way things are made. I would never compromise the way a garment is constructed, so you have to counterbalance that with something funny to make it even more interesting. When everything is so serious, it becomes really boring. When everything is so serious, it becomes really boring. Marc Karimzadeh: Who is your muse? Thom Browne: My fictional muse is in my head, for both men and women. It’s somebody who is really individual, and very confident on their own. Thom Browne: Include Andrew in that too. He is throwing me under the bus, I am going to throw him under the bus, too. Marc Karimzadeh:Tell me about that side of Thom Browne. What appeals to you about reality TV? 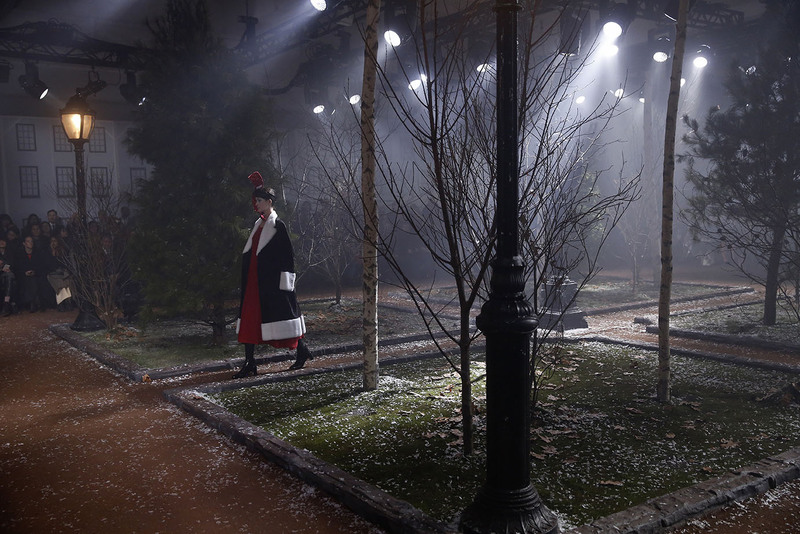 Thom Browne: It’s having the time to turn off and mindlessly not doing anything. We always joke that life sometimes never stops, even when you’re on vacation. Especially when you own your own business and you have 10, 12 collections a year, you are always thinking of something. Marc Karimzadeh: Do you have a specific character you particularly love on Bravo or E!? 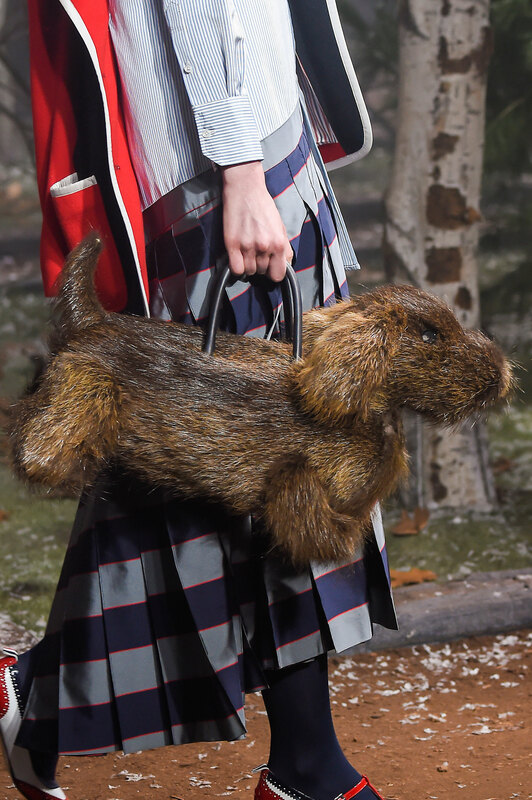 Thom Browne: Well, no. The only ones we really watch are the Kardashians. I think they’re funny, and you have to give them credit, because they did it for themselves. Marc Karimzadeh: Is there a Kardashian-Jenner that you would like to see in your clothes? Let’s take Kendall out of the equation because she is a model, and so she doesn’t count. Thom Browne: Whoever would want to wear my clothes. There is this celebrity culture we live in, but I don’t really jump into that world unless they really want to wear it. The last thing they need is to be given more clothes. It only really means something when they seek it out themselves. So if Kim wants to call in to wear something, then great. Marc Karimzadeh: I feel that we live in a strange moment in celebrity culture. What’s your take? Thom Browne: It’s amazing when you succeed as an actor or an actress, or however else you become a celebrity. I personally am a fan of professional athletes as athletes. They are the most inspiring to me. I love the Olympics. I love athletes who are the best in the world. I get so emotional watching them. They deserve everything that they get. Celebrity only works for me when they appreciate what I do as much as I appreciate what they do. Seeing Lebron James in my clothing… I couldn’t ask for something better than that. He wanted it himself. Marc Karimzadeh: It’s interesting that you mention athletes and the Olympics. I know that you are a runner. How do you see your aesthetic translate into active-wear? 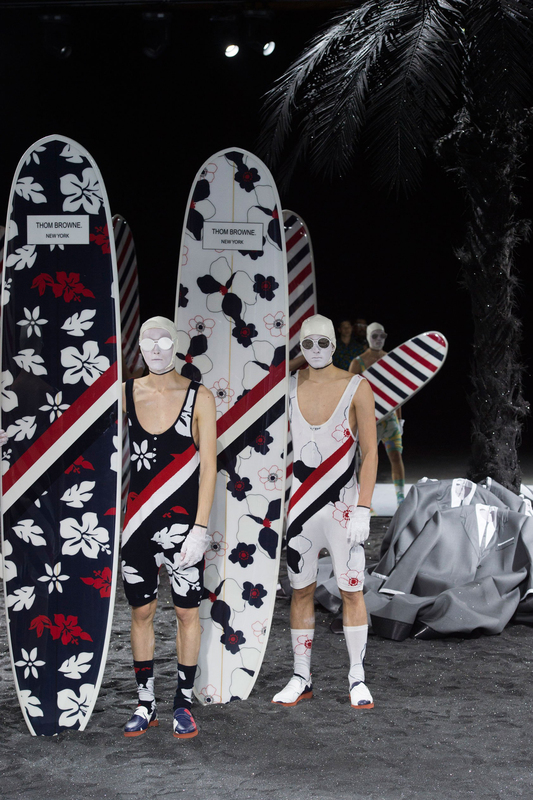 Thom Browne: I would love to do that, because sports are so true to who I am. I would do it in my own way. There is an athletic sensibility to a lot of my collections, but it’s not a literal representation. Guys and girls that are interesting to me take care of themselves and are interested in sports. I would love a specific athletic sports collection because it is very true to who I am. It would be a lot simpler to what people do these days. I think I would pull the colors back a lot, maybe to specifically red, white and blue. There is something about sports that is very pure and clean and that’s how I would approach it. I have sweats in my collections that do really well for me. Marc Karimzadeh: Your idea of Thom Browne athleisure. By the way, congratulations on your third Menswear Designer of the Year award at the CFDA Fashion Awards in June. How did that moment feel for you? 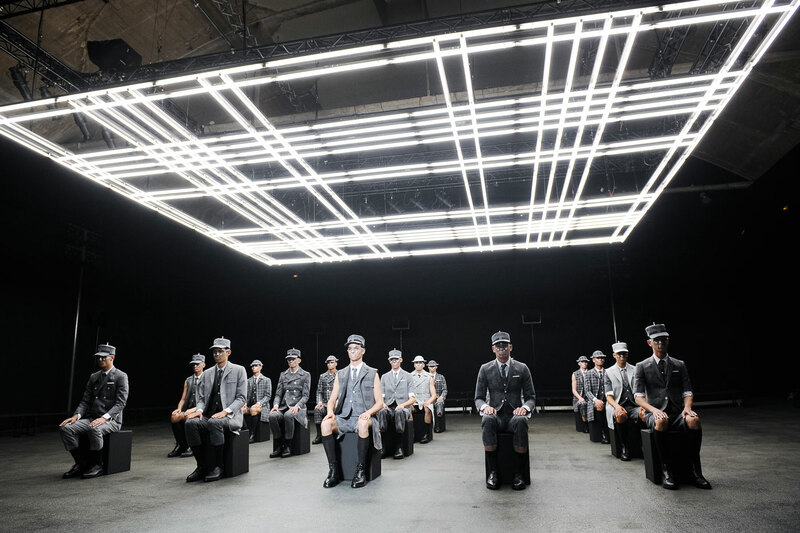 Thom Browne: Somebody beforehand asked me how it feels. I think they expect answers like, ‘Well, it becomes common and somewhat expected.’ But honestly, it becomes more important as you go on in your business in the fashion world. I think winning the third is almost more important than the prior two, because I am still here and I am still doing it. The fact that it’s still appreciated is just really important and makes it really special. 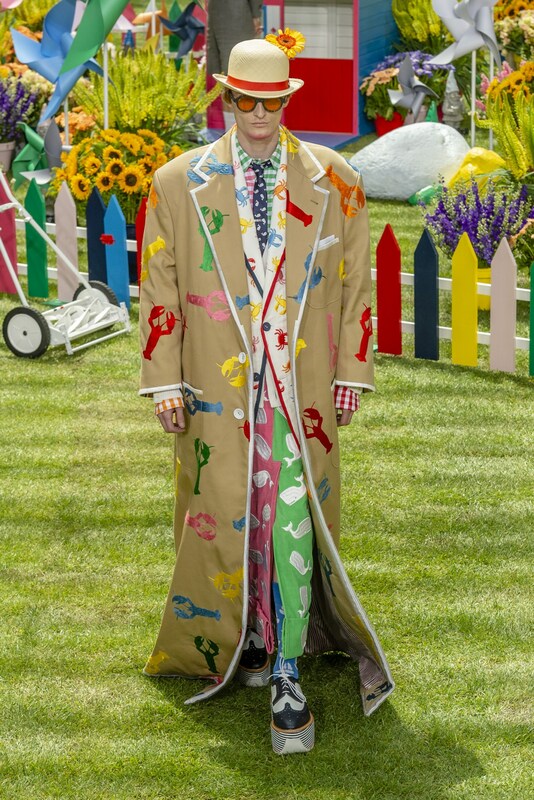 Thom Browne: I would love people to see that it’s a real aesthetic. There is a confidence and individuality in the uniformity of it. That’s really interesting to me and that’s what I would like people to see. I love the idea of people wearing the same thing every day. There is something about people who have a real true sense of themselves that makes them confident enough to wear the same thing every day. I remember once reading an article in which Isabella Rossellini said she wears the same navy suit every day. She thinks she looks the best in it, so why change? There is something really charming and confident about that whole idea. At the Awards, the girls were wearing the same suits that we were wearing. There was something very feminine and something very strong about it. There was more strength in the women wearing it than in the men wearing it. There was a conscious decision to put everyone in suits as opposed to dresses for the girls. Marc Karimzadeh: Where do you see yourself in five year’s time? Do you think about the future or go step by step? Thom Browne: I don’t know specifics, but I know that I want the business to grow a lot. I know I want to open a lot of my own stores. I feel that, especially with my new partnership with Sandbridge, we are starting over, and the business is at such a good place [Sandbridge Capital, LLC bought a controlling stake in Thom Browne earlier this year]. The business is so strong now, and we almost joke that we are like a startup business with a really strong base to start from. Women’s is still very new and there is so much to do with women’s. That’s a strong focus in the future, and will stay true to the strong tailored aesthetic. I want the business to become whatever it can be and I want to be open to all that it can be. Marc Karimzadeh: You will have to get yourself a couple more dogs as inspirations for additional bag hits. Thom Browne: Hector could use a brother or a sister, but we’re not going to have another dog. I am trying to talk one of my employees into getting a dog. That way, Hector could have a playdate.